Created by architects Raumlabor, the Floating University in Berlin invites students and experts from all over the world to explore solutions for future urban challenges. It’s said that the things we learn at university today will be outdated by the time we graduate. So what does a learning environment look like where students research cities of the future? Berlin-based architecture office, Raumlabor, created a floating university in the middle of a rainwater basin to explore this question during the summer months. The campus is under constant development — students, professors and experts will be implementing ideas they come up with during their research. You can find familiar elements, such as a library, workspaces and an auditorium (with a pool!). But there’s also an experimental kitchen and bar, a water-filtering system and a fast food plantage, where potato and tomato plants are grown. 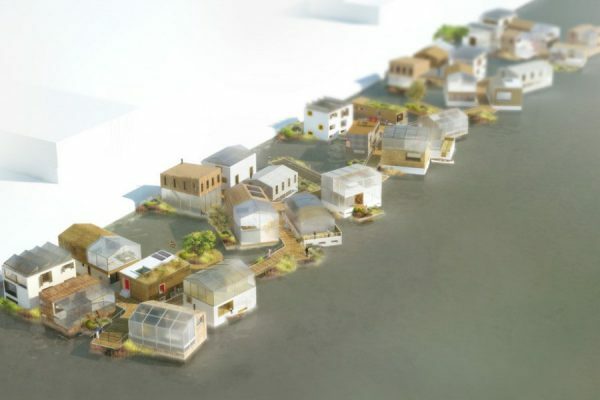 The Floating University invites international student groups from the fields of architecture, design, arts and sustainable technology to participate. They will be making use of the platform for hands-on research, prototyping and testing their ideas. The campus will be open for the public with tours, performances and workshops for citizens of all ages. You can learn how to make a solar oven, help build a water park, or learn how bacteria can clean water so it can be used to fill up a bathtub or wash dishes! Since the campus was planned to be only temporary, the Floating University will close mid-September. All construction materials used in the making of the school were either rented or be used for upcoming projects, exemplifying the flexibility of pop-up buildings of the future. Schoonschip will soon emerge in the North of Amsterdam. Literally translated to “clean ship”, it will be a clean, floating, sustainable neighborhood. This truly fantastic breathing beast named ‘One Hundred and Eight’ is an interactive, wall-mounted installation by Berlin-based media artist Nils Völker.